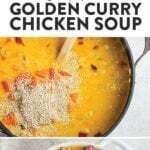 Get out your stock pot because we’ve got an amazing healing one pot golden curry chicken soup that is calling your name. 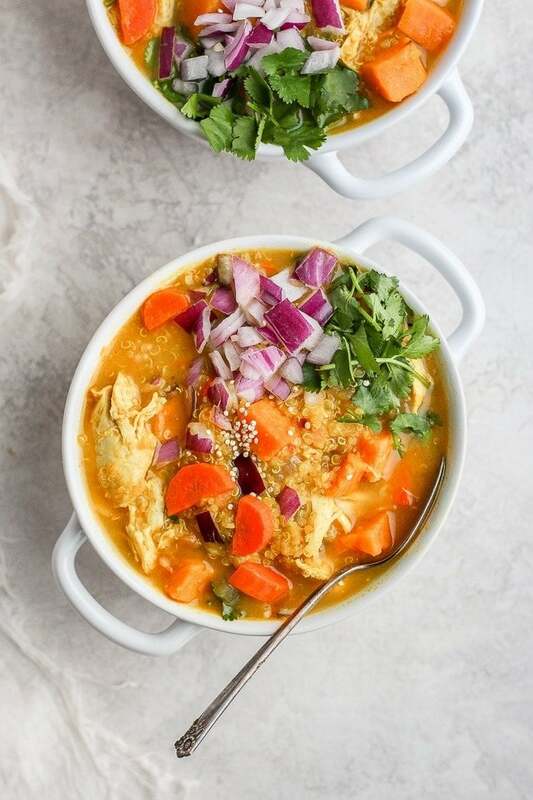 This veggie-packed coconut curry chicken soup has a delicious flavorful broth filled with anti-inflammatory spices and includes 2 types of protein. I wish soup season was every season! It sort of is here in Minnesota, mostly because we skew colder year round. 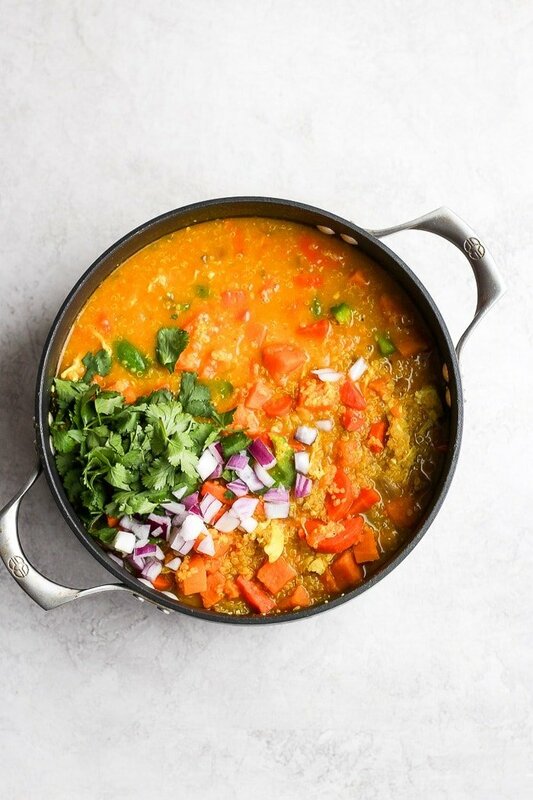 Today we’re sharing an epic, healing golden curry soup packed with protein and #alltheveggies. Our famous Spicy Coconut Thai Curry Soup is what sparked the creation of this soup. 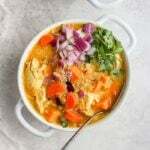 So many of you have made that and loved every bite, so we thought we’d make something a little bit heartier and with more anti-inflammatory spices to soothe the soul. 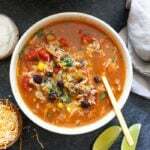 Plus, if you’re looking for foods to eat when sick, you came to the right place, becuase this is a cold-fighting soup that also tastes delicious! So? 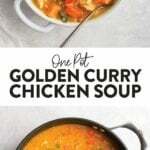 Ready, set, let’s make some golden curry chicken soup! 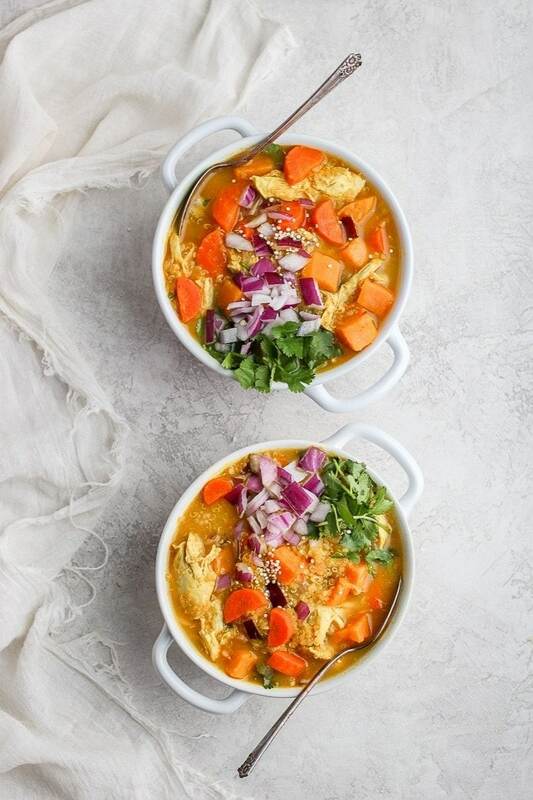 There are three parts that make up this amazing curry chicken soup: the protein, vegetables, and broth. In a good soup, you can’t just have one of these components, you need to have all 3! 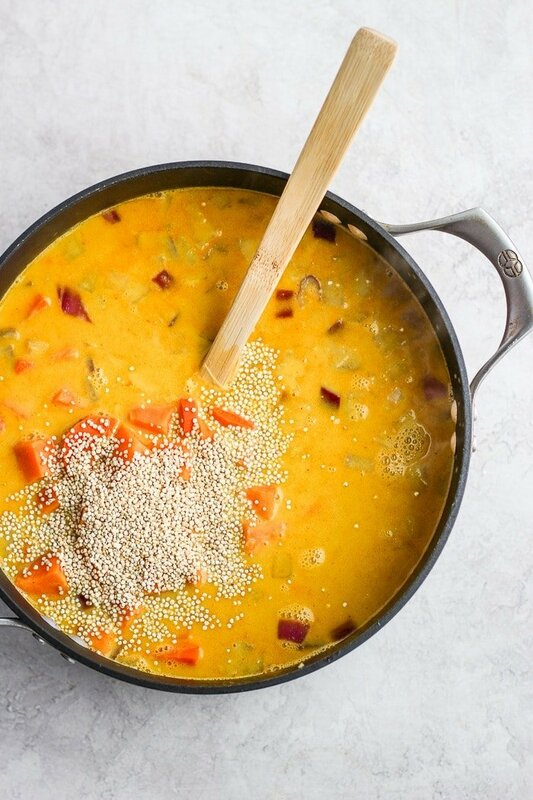 Plus, we specifically wanted this soup to be a great healthy soup to make when sick that had sustenance, protein, and amazing flavor…with all of the anti-inflammatory benefits! Chicken: you’ll want to pick a pound of boneless, skinless chicken breast. Thighs will also work, but the meat won’t be as lean! Quinoa: we decided to add quinoa for some extra protein and texture. Quinoa is a complete protein and rice is not, which is another reason we went quinoa over rice. Sweet Potatoes: From their sweet flavor to fiber, calcium, and vitamin c content. 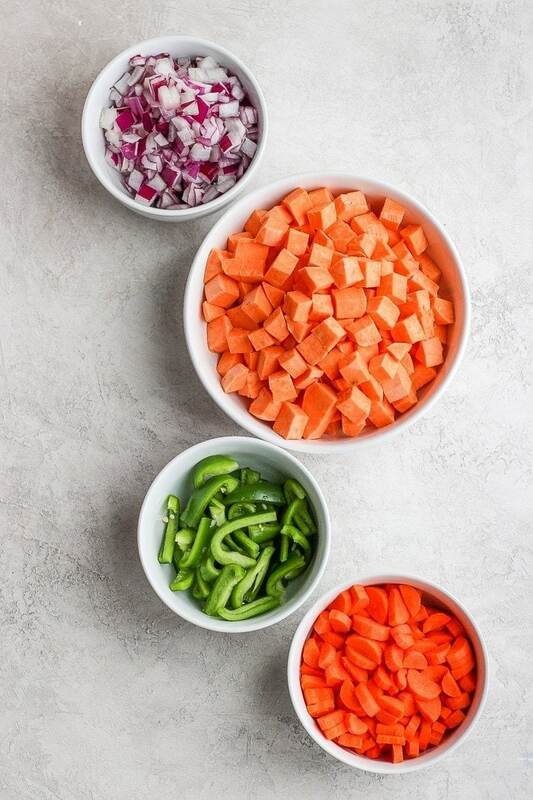 We love adding sweet potato to any and all soups. Carrots: carrots are a hearty vegetable that pack in the beta-carotene, fiber, and vitamin k. Oh, and they are pretty darn affordable! Onions: Not only do onions add an amazing savory, caramelly flavor, but they’ve got fiber, folic acid, and vitamin b. 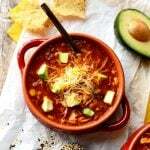 Green Pepper: In addition to adding some contrasting green color to this soup, green bell peppers are naturally sweet and offer vitamin c and carotenoids. 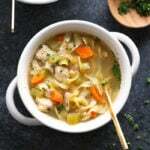 Full-fat coconut milk: full-fat coconut milk is a great way to add amazing flavor to this broth and it’s also lower in carbs. 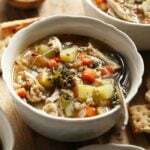 Chicken broth: The base of the broth is made with chicken broth. Feel free to use whatever broth you have on hand such as vegetable broth or even bone broth. Turmeric: this superfood is anti-inflammatory and loaded with antioxidants! That’s why we used an entire teaspoon. Ginger: Ginger is a great tummy soothing spice, plus a little goes a long way with flavor! Lemongrass: lemongrass is amazing for digestion and soothing the stomach. Its flavor is also quite wonderful in this soup. Cilantro: In addition to its fresh flavor, cilantro helps rid the body of heavy metals along with helping to balance out the body’s blood sugar levels. Garlic: garlic is one of the most popular flavors in savory dishes. For being low calorie, it’s packed with nutritious vitamins and minerals such as manganese, vitamin b6, vitamin c, and fiber. 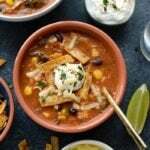 Before jumping into the full recipe I wanted to make a few notes about this soup and why it’s so amazing. So, you already know that it’s packed with nourishing ingredients and herbs which makes this a perfect sick soup. What you might not know yet is that this soup is a one-pot soup even though it contains both a grain and a protein. What exactly does this mean? Well, it means you throw everything into this soup raw and let it cook from there. Often times soup recipes that call for rice or quinoa have you cook the grain separate. Not this one, everyone! You cook the grain right in there with everything else and same with the raw chicken breast. 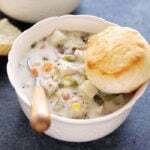 Lucky for you, we created a video so you can see how easy this soup really is to make. Lastly, I know lots of you are plant-based. Well, good news for you! 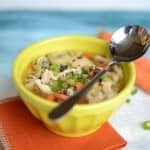 You can skip the chicken and swap the chicken broth for vegetable broth and boom, you’ve got yourself a veggie and protein packed soup! You can always add some tofu or a legume such as garbanzo beans if you are looking to up the protein even more. Begin by heating a large pot or dutch oven over medium/high heat and add olive oil and minced garlic. 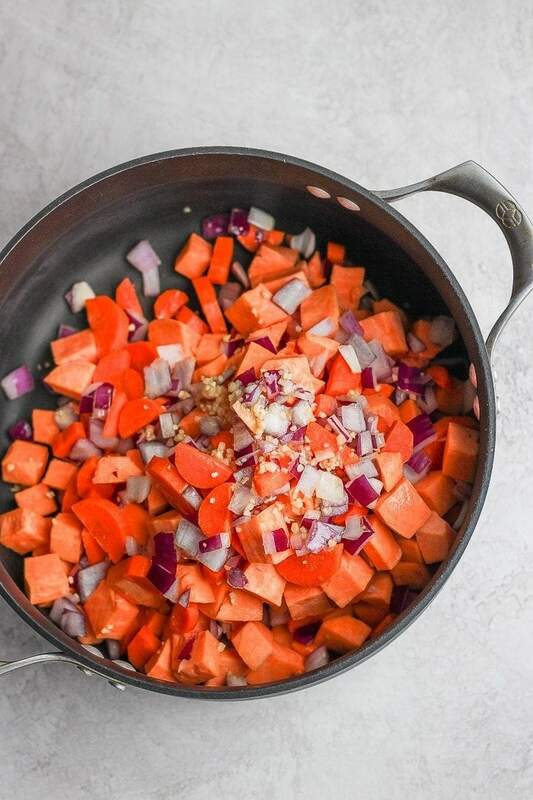 When olive oil is fragrant, add sweet potatoes, carrots, onion, and salt to the pot and saute for 5-7 minutes. Stirring periodically. Next, add in curry paste, chili sauce, sriracha, uncooked quinoa, 4 cups of broth, and coconut milk. Mix together until combined. After ingredients are combined, add ground turmeric, ground ginger, salt, chicken breast, and lemongrass to the pot and mix well. Make sure that the chicken breast is submerged in liquid and bring to a boil over high heat. Turn heat to low and cover pot. Let the soup simmer on low for 30 minutes, stirring halfway through. After 30 minutes, remove chicken breast from the pot and add your last two cups of broth. Mix well and cover the pot. Shred your chicken breast with two forks and add it back into your soup along with the sliced green pepper. Let soup simmer for an additional 5-10 minutes and then add in lime juice and herbs right before serving. 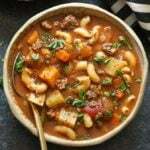 Vegetable Minestrone Soup + Big Powderhorn Mountain!